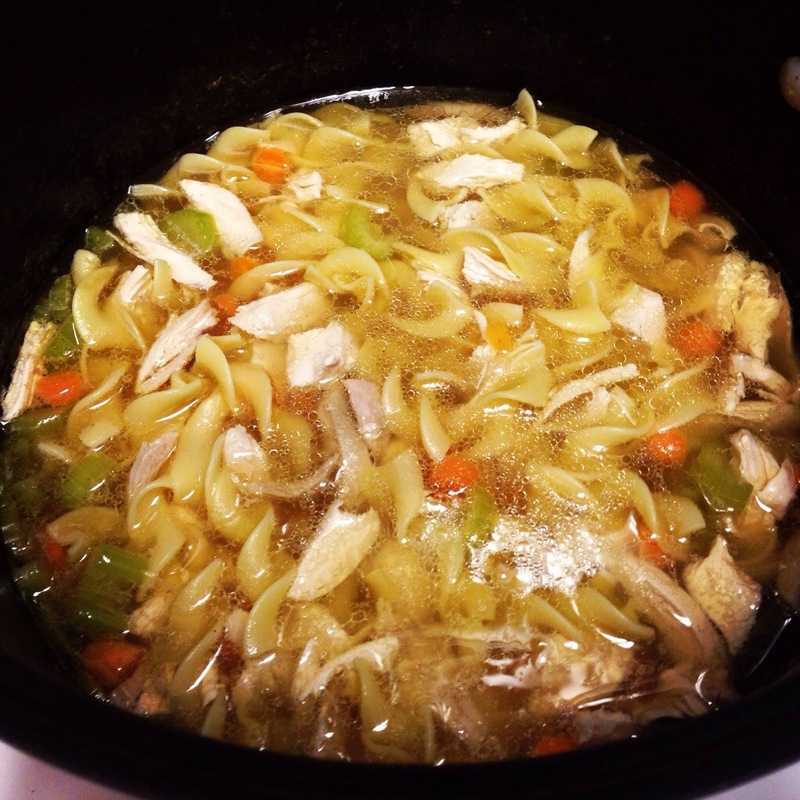 This chicken noodle soup kept us warm during the snowstorm that destroyed the south. I personally did not abandon my car on the highway. Probably because it was just a midwest standard amount of snow and I was highly motivated by the two perfect chickens waiting in the fridge. 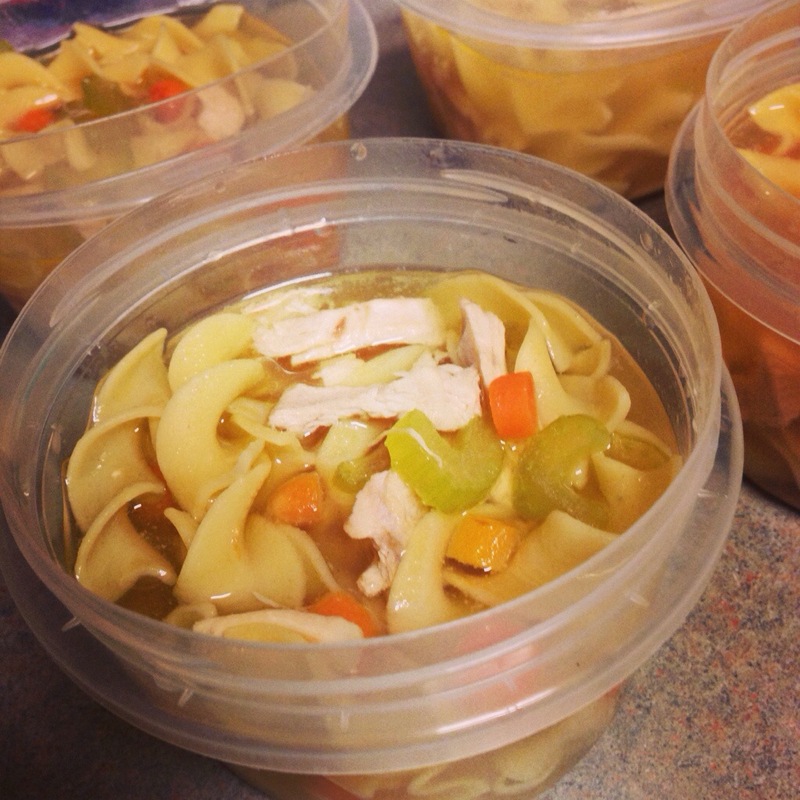 According to some legit medical research, chicken noodle soup may actually have real effects on your immune system. It may even prevent infection with influenza. This soup is extremely good. The flavor in the broth is insane and inspires me to make homemade chicken broth the Bubbly Kitchen standard. The other great bonus is this recipe makes too much chicken! You don’t need to use all the chicken that you cook in the broth. If you make a double batch of this soup with two small chickens or six pounds chicken parts, you will have enough left over chicken for another meal. See Cheesy Chicken and Rice or Cheesy Chicken Enchiladas. I just made a double batch of this in preparation for being too busy to cook next month, and we already ate most of it… oops. My sous chef also may have eaten most of the extra chicken while it was sitting on the counter waiting to be put away. If you want to decrease the calories in this soup, use only three ounces of noodles. These egg noodles cooked in the chicken broth are pretty amazing though. You can also refrigerate the broth prior to making the soup. This will allow you to skim the fat off, decreasing the calories. But as prepared below, this has 400 calories in 12 ounces. You can use whatever chicken parts you want for this soup. It is sometimes cheaper to buy a whole chicken and cut it up yourself. But if you are not into chicken surgery, you can usually ask your grocery store butcher to cut the chicken up for you. Over medium-high, heat the vegetable oil in a large heavy pot. Add in the onion and saute for 5 minutes. Brown the chicken in this pot. 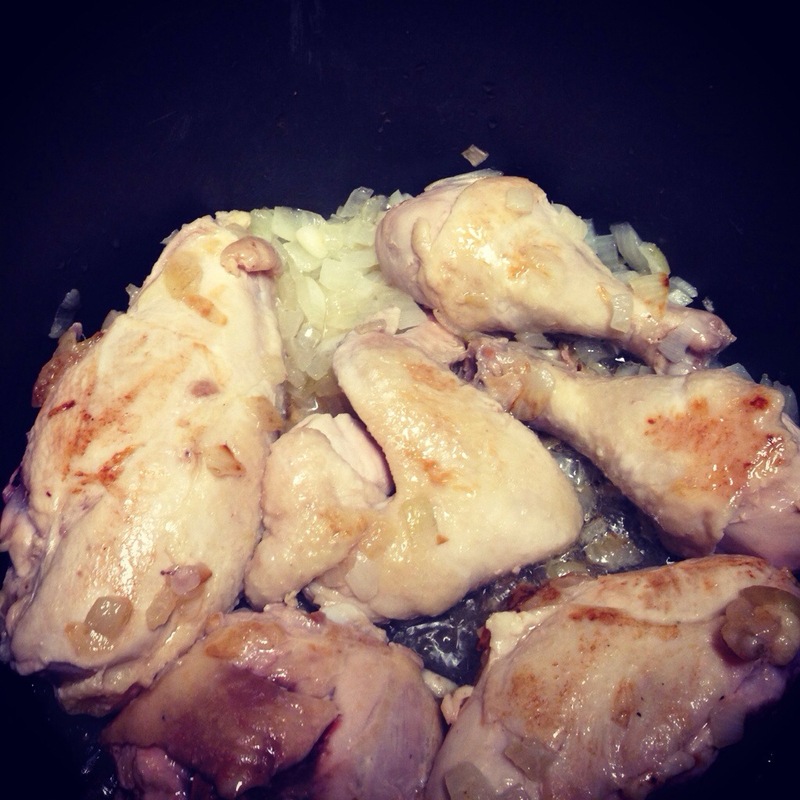 Work in batches so that the chicken pieces get good contact with the bottom. Cook for 10 minutes, turning to brown on each side. Pour in the water, bay leaf, salt, and black pepper. Bring this to a boil and reduce the heat. Simmer the broth for 20 minutes, partially covered. 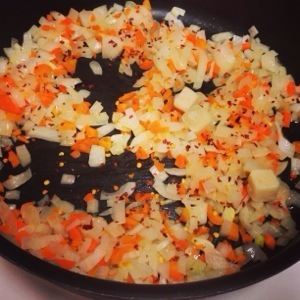 Use a spoon or strainer to skim the unwanted stuff that surfaces to the top of the soup. Remove chicken to a plate. Over a large bowl or super sized measuring cup, pour the soup through a fine strainer. Use a paper towel to wipe out the pot. Return broth to pot and bring to a simmer. When the noodles and vegetables are cooked, add the chicken back in. Cook until heated through. It is impossible to believe January is over and we are well into 2014. I have been cooking like crazy in preparation for next month. I will be working super long hours with only four days off. So I am stocking the freezer with lunches and dinners. 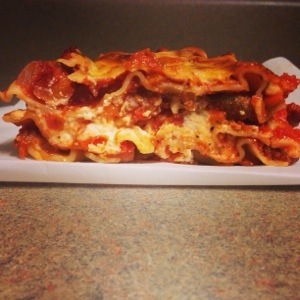 Freezer recipes coming soon to the blog! I made these brownie bars on a whim. I was running out of time before a girl’s night dinner party. I was kind of skeptical while preparing them but they are amazing! I think all the dinner guests loved them as well. I would take their opinions with a grain of salt considering I took out a trash bag of 7 empty wine bottles the next morning. In other news we still have not bought any bread in 2014. I feel very accomplished considering it has been over a month of home bread baking. I have been perfecting the recipe and will post my current go-to white bread recipe soon. It really is an interesting chemistry experiment baking bread every week. Bubbly Kitchen is also very excited to announce that we are providing cupcakes and other desserts in Eastern North Carolina for weddings, showers, parties, and any other occasions. Please see the events page for further details. 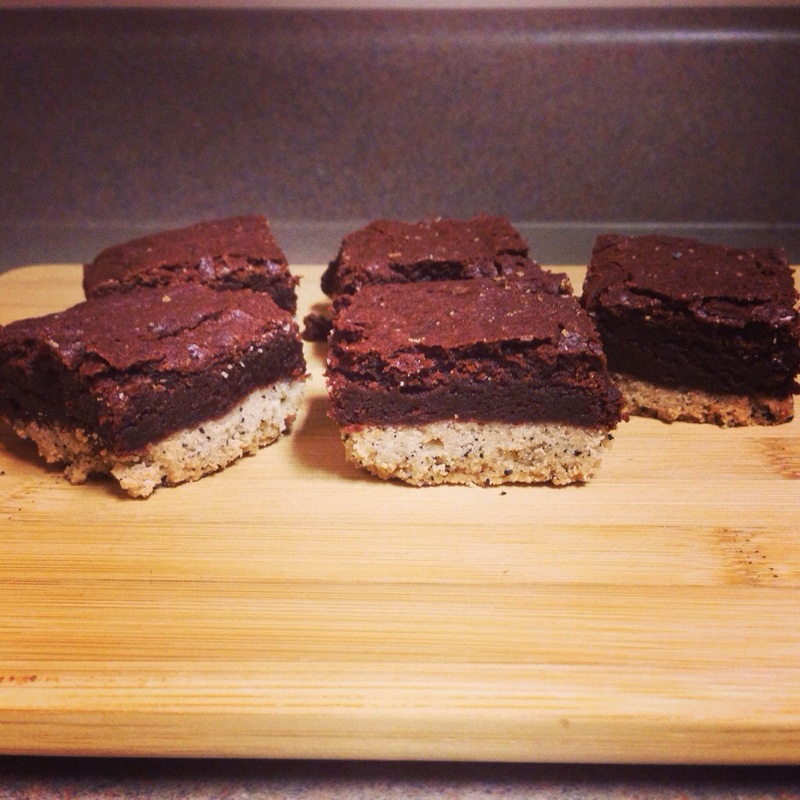 Anyway, here are the delish espresso shortbread brownie bars. We drank red wine with these and it was a perfect compliment. This rich dessert could be complemented by a dry red or sparkling wine. It is very important to stock your wine fridge in a strategic way. You should have bottles specifically for week night dinners, special occasions, dinner parties, and more rowdy parties. Although it is kind of ordinary, I like to have Ménage à Trois Folie à Deux on hand for parties. It is such a drinkable wine that everyone enjoys. It is also inexpensive, which is great when your dinner guests carouse late into the night. Preheat the oven to 350 degrees. In the bowl of a food processor, combine the butter with the flour, sugar, ground espresso and salt. Pulse until coarse crumbs form. 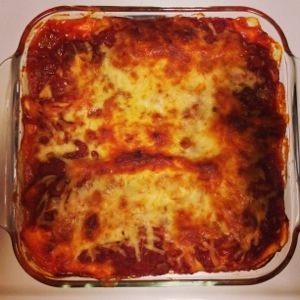 Press the crumbs into a 9×13 inch baking pan. Freeze for 10 minutes until form and prick all over with a fork. 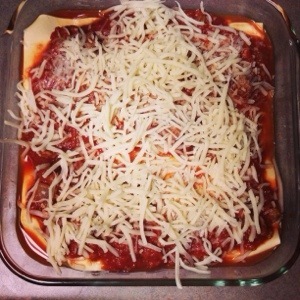 Bake for 30 minutes until lightly browned. Whisk together the flour and cocoa, salt, and baking powder in a medium bowl. Melt the butter with the chocolate in a large saucepan over low heat. Remove from the heat and stir in the sugar and vanilla, then stir in the eggs. Add in the dry ingredients, stir until smooth. Pour the brownie batter over the baked crust. Smooth the surface with a spatula. Bake for 30 minutes. The brownie is done when it is dry to touch and lightly cracked around the edges. Let cool before cutting. 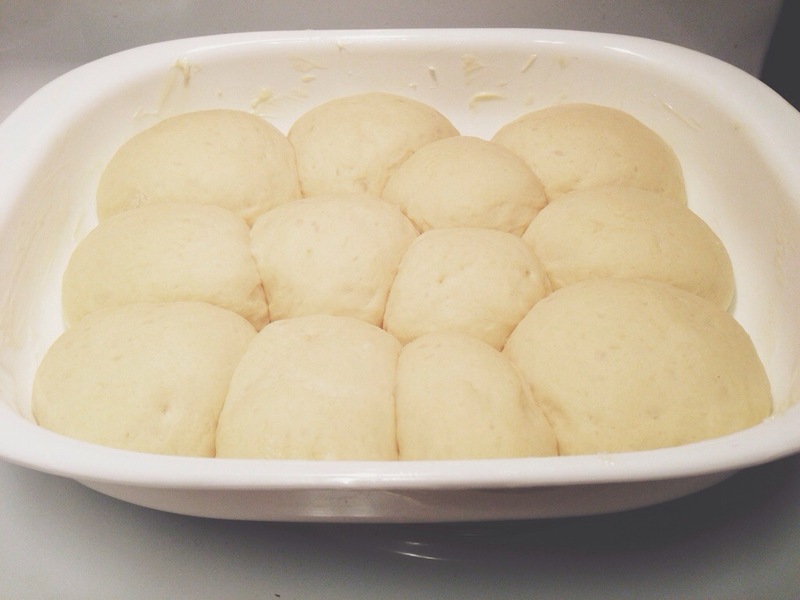 If we are baking all our own bread in 2014, surely we are making our own dinner rolls. 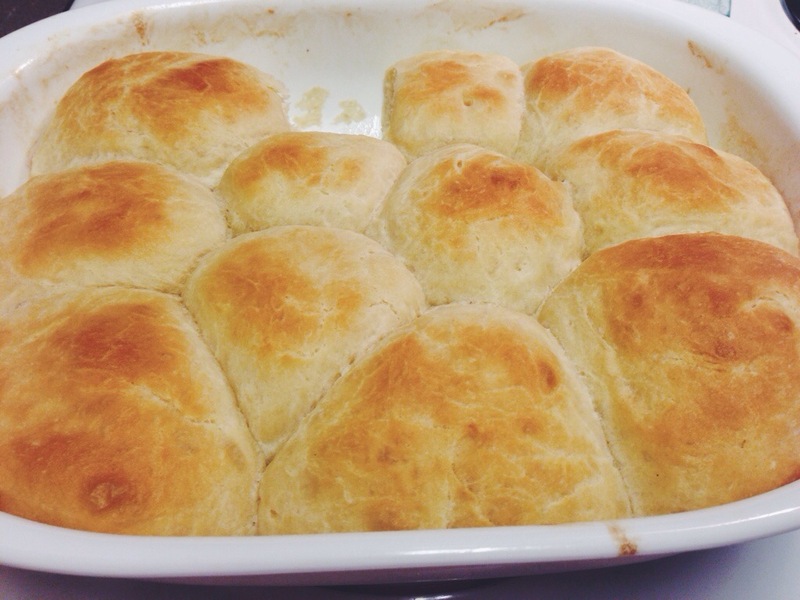 There are few things more comforting than a freshly baked dinner roll. And these are just so delicious and easy! They are a fabulous addition to all of the winter soups and stews. See here and here. You can also make these ahead of time until the 3rd step (forming the dough into rolls) and store them in the fridge or freezer. 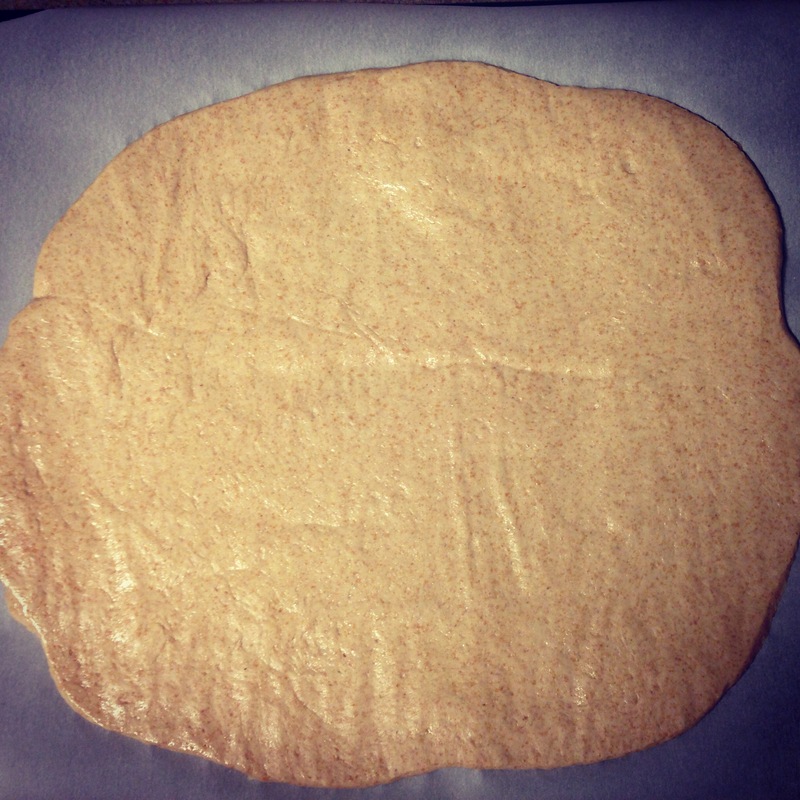 To freeze, place the formed rolls on a sheet pan lined with parchment. Place this in the freezer. 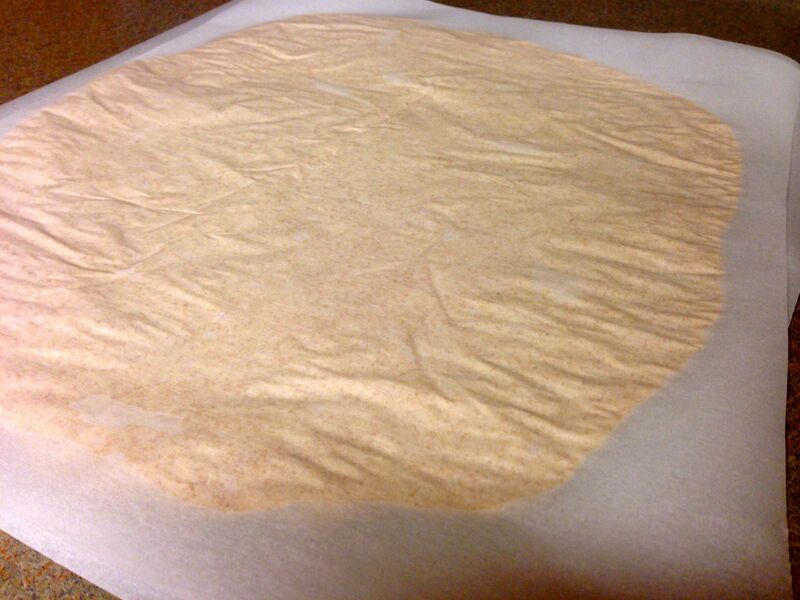 Once solid, transfer the rolls to a freezer bag. When you are ready to serve them, remove them from the freezer and place in a greased baking pan. Allow to thaw in the fridge overnight. 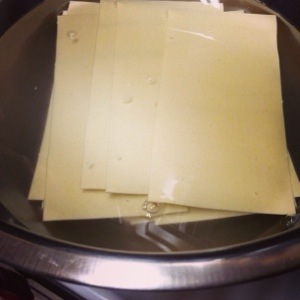 Remove them one hour prior to baking and allow them to sit at room temperature. 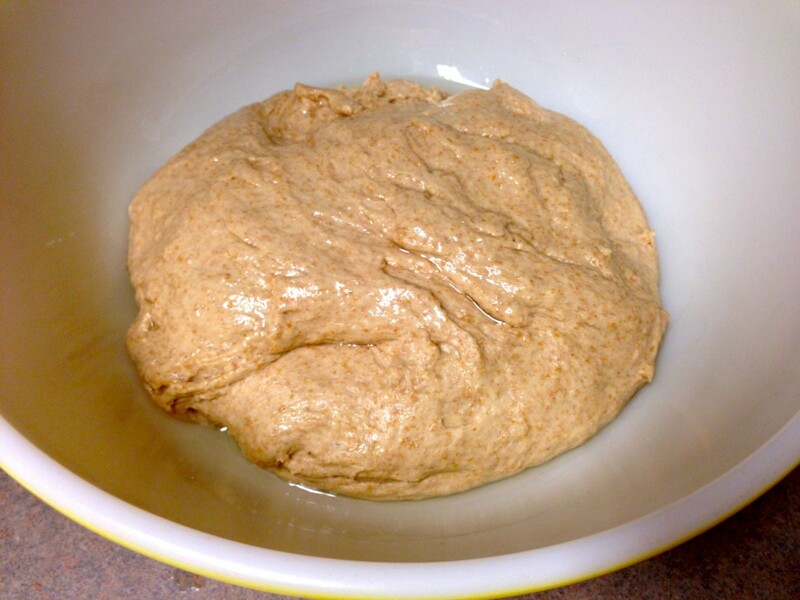 In the bowl of a stand mixer fitted with the dough hook, dissolve the yeast in warm water. 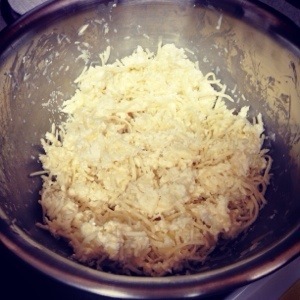 In a separate small bowl, whisk together the milk, egg, vegetable oil, sugar, and salt. Mix this into the yeast mixture. Add in the flour until a dough forms. Knead by turning the mixer onto low speed for 8 minutes. Cover the mixer bowl with plastic wrap and allow the dough to rise in a warm place for approximately 1 hour. The dough should double in size. Turn the dough out onto a lightly dusted work surface. Divide the dough into twelve pieces, Shape the dough into rolls by rolling between your hand and the counter. Grease a 9×13 inch pan with butter. Place the rolls in the pan leaving some space between. Allow to rise for 30 more minutes. Preheat the oven to 375 degrees and melt the 1 tbsp butter. Brush the rolls with the melted butter. Bake for 16 minutes, rotating halfway through, until golden.